The bearing capacity of a new double ring reducer increases with the increase of load because of the elastic deformation of the gear tooth. In order to solve the problem of its bearing capacity quantificationally, the concept of the maximal bearing capacity is put forward. Starting with that the single tooth bending stress is up to the bending fatigue strength, a mathematical model to determine the normal backlash of the gear teeth has been established, the maximal deformation of the single tooth has been determined. The mathematical relationships have also been setup between the normal backlashes of the tooth pairs, the maximal deformation and number of contact points, a corresponding MATLAB program is designed. The maximal bearing capacity of the reducer has been estimated through examples and proved by experiment. 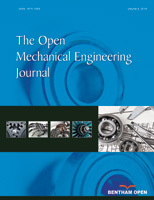 The results show that the calculation method is more effective and fully considers the factors that the elastic deformation of the gear tooth can increases its bearing capacity, so the structure of the reducer is more compact, which establishes the theory foundation for designing the reducer.